Precisely 7967 first-year students have so far registered for the new semester at LMU. This brings the total number of students on campus in the new term to approximately 51,000. The figures cited above mean that both the size of the new intake and the total number of students registered will remain essentially constant. The same is true for the proportion of female students on campus: Approximately 30,000 are now on LMU’s books. And these tens of thousands of young minds should have little problem slaking their thirst for knowledge. 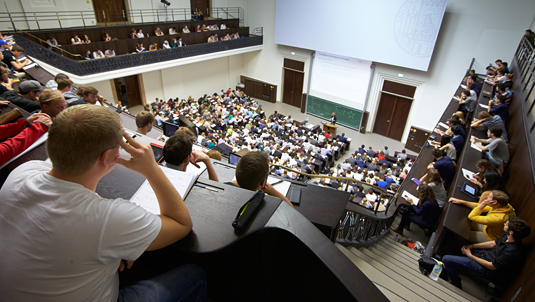 No less than 15,585 classes are on offer this term – ranging from seminars for MSc. students through field-trips to special language courses. LMU’s attractiveness for students from elsewhere continues to grow: More and more foreign students are choosing to study at the University. According to a preliminary statistical assessment, there are now some 8400 international students at LMU. This represents an increase of around 7% over the corresponding figure for 2015/2016. The most popular degree courses at the University are, once again, those in Law, Medicine, Economics and Physics – and although registration is ongoing, all the indications are these are the subjects that will draw the largest numbers among the new crop of first-year students also.